The quoted verse is likely a verse we have heard. It comes from Jesus teaching at the temple on sin. Jesus speaking in a time when a majority of people were most likely slaves tells those listening that if they remain in His word and remain His disciples, they will know the truth and they will be free. Puzzled some respond, we are free since the time of Abraham. Jesus tells them sin enslaves. I suspect with just a little life experience we have learned this truth on our own. Likely as a young person who might have done something, took something, stayed out past curfew, or done some simple disobedience we discovered a lie can hold our thinking hostage for a long time. We also learned that being discovered or revealing our untruth was freeing. Thus hearing the verse we can acknowledge its truth. At least I hope we learned that lesson when we were young, when the consequences of our actions were minor. Sin and untruth use to be clear, but today we fall into a trap of accepting more than we should. Pope Benedict spoke about relativism. The idea that truth exist in relation to culture and society and is not absolute. Christians have become people, who can justify lots of varying behaviors. We can be against abortion and for the death penalty, although it seems a contradiction. We should know the truth. 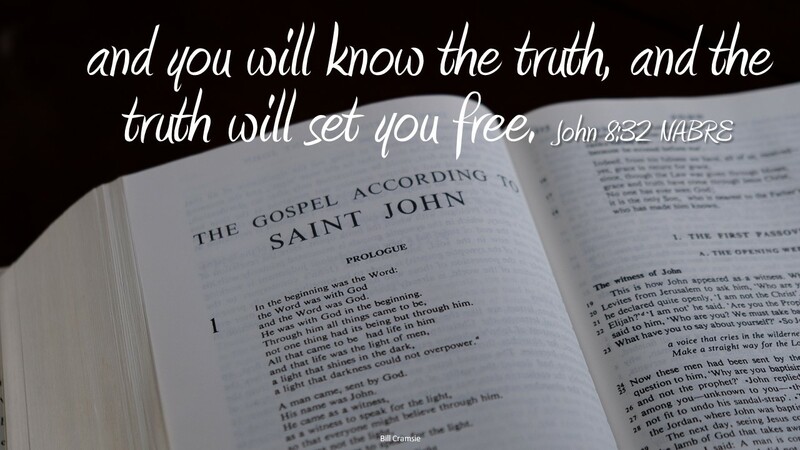 For followers, Jesus tells us He is the truth, knowing His word we will know the truth. Therefore it is important to be steeped in the word of Jesus, His gospel message. By being in the word daily we put on an armor that can block the lies of relativism, keep us from justifying and accepting all kinds of questionable behavior. Being in the word will keep us free. Do you spend time daily in the word of Jesus? Is there something that enslaves you?